Life Worth Leading is a 501(c)(3) nonprofit organization, and SCUBA is part of our nonprofit. We have a very flexible schedule that can accommodate your needs. Just contact us and we will be happy to arrange a private class or a small group class. The cost difference is just $300, and either way, you will get lots of one-on-one attention to ensure that you master your skills and leave the course as a certified diver who is safe and enjoys the experience! No matter how much additional time it takes, Gabrielle never charges extra to spend additional training and practice time with her students. She also won't certify students until they are ready to be safe, happy divers! The beauty of scheduling any classes is that students determine their own schedules; we agree to a first meeting date then everyone brings their calendars to the first session to plan remaining sessions. Gabrielle is a VERY active instructor trainer, so there are always opportunities for more diving. There are two options for taking a class with Gabrielle through Life Worth Leading, a 501(c)(3) nonprofit organization. Regardless of your preference, please complete the online registration form so we may contact you about upcoming opportunities. Note that we offer military discounts, scholarships for people with disabilities, and more. 1. Take a scheduled group class. There are two group classes currently underway, one that began 25 February and another that began 8 April. The next Open Water SCUBA certification course will begin in May. Cost is just $350 inclusive of textbook, workbook, log book, dive table, carrying case, 32 hours of instruction, pool sessions, 5 checkout dives including 4 SCUBA dives and one skin dive, certification card, gear, etc. Bring a dive buddy and you will each get $15 off! Discounts are also provided for military, veterans, and first responders. To secure a slot in the class, please complete the online registration form. 2. Request a private class and set your own schedule (cost is just $300 more than a group class). Private classes are usually one-on-one or with two students. To request a private class, please complete the online registration form for SCUBA classes. The next Instructor Institute for Instructors, Assistant Instructors, and Divemasters will begin in May. This includes crossover for those coming from another agency. Contact Gabrielle for details. The next Advanced Open Water class Gabrielle is offering will be in April and May in Tallahassee, Panama City, Branford, and Williston, Florida. Another class will be offered in May in Palm Beach, Florida. The class involves 5 SCUBA dives including a navigation dive, night dive, and deep dive (100'). Space is limited, so contact Gabrielle ASAP if you would like to take the class. Cost is $220, or if you take it with the Nitrox class, discounted to $340 total. The only additional cost is any entry fees to dive sites. To secure a slot in the class, please complete the online registration form. The next Nitrox class that Gabrielle will be offering includes lecture, exam, and two checkout dives beginning April in Tallahassee or in May in Palm Beach, Florida. Cost is $200, or if you take it with the Advanced Open Water class, discounted to $340 total. That includes BOTH certification cards, Nitrox 32 and 36 tables, workbook, SCUBA gear rental, and 5 checkout dives. The only additional cost is any entry fees to dive sites. To secure a slot in the class, please complete the online registration form. 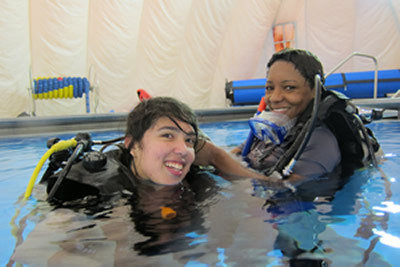 The next Diver Rescue and Accident Management class that Gabrielle will be offering is in June. Cost is $280 inclusive of instruction, materials, checkout dives, and certification card. Prerequisites are First Aid, Oxygen Provider, and CPR. Divers must also have earned Advanced Open Water certification or logged 10 dives after Open Water. To secure a slot in the class, complete the online registration form. The next HSA Dive Buddy class that Gabrielle will be offering is in June 2019. Cost is $300 inclusive of instruction, materials, pool training, checkout dives, and certification card. Prerequisites are First Aid, Oxygen Provider, and CPR. Divers must also have earned Advanced Open Water certification or logged 10 dives after Open Water. To secure a slot in the class, complete the online registration form. Gabrielle offers O2, First Aid, and CPR, as well as other Diver's Alert Network courses, about once per month. To sign up and be contacted about the next availability, complete the online registration form. The next Lifesaving CPR, O2, First Aid and Hazardous Marine Life classes that will be offered are in July 2019. Contact Gabrielle for details and please complete the online registration form. Take SCUBA Diving Classes with a group or private classes! Group classes are usually 4-6 people, so you will get lots of one-on-one attention. If you have a hectic schedule, a private SCUBA class may be a better option. Contact Gabrielle to make arrangements to learn how to SCUBA dive in Tallahassee, Florida and the surrounding areas. Take SCUBA Diving Classes with a group or private classes! Group classes are usually 4-6 people (typically a little larger class size in the summer), so you will get lots of one-on-one attention. If you have a hectic schedule, a private SCUBA class may be a better option. Note that if you begin a class then for whatever reason drop out, you are responsible for a $100 cancellation fee plus the cost of materials. If you take the class but do not successfully complete your certification, your class registration fees will not be refunded. Contact Dr. Gabrielle K. Gabrielli to make arrangements to learn how to SCUBA dive in Tallahassee, Florida and the surrounding areas.